Kittiwake and Chris. – Dirty wet dog , boats and sailing. A few weeks back i had an urgent message from my mate Chris asking me if i knew of anywhere he could borrow or hire a trailer to get his new boat project home. I didn’t have one as i had given him the trailer that came with the Osprey dinghy project and didn’t know of another one kicking around. Chris is s very resourceful bloke and eventually did get the boat ashore and home with a lot of improvisation. It turns out that Chris had responded to someone who was having to get rid of a boat project and was giving it away for free if the receiver could collect it : the same bloke then got messed around by people getting shirty just because there wasn’t a trailer with it. Our man then did get the boat but had a bit of an epic getting it home where its now sitting under a temporary cover and being worked on. I caught up with Chris this week to go and take a look what he is up to. I think that the boat is an Iain Oughtread design although the hull is moulded GRP rather than clinker/lap plywood. Its possible that a mold was taken off an original and this one was built from the mold. 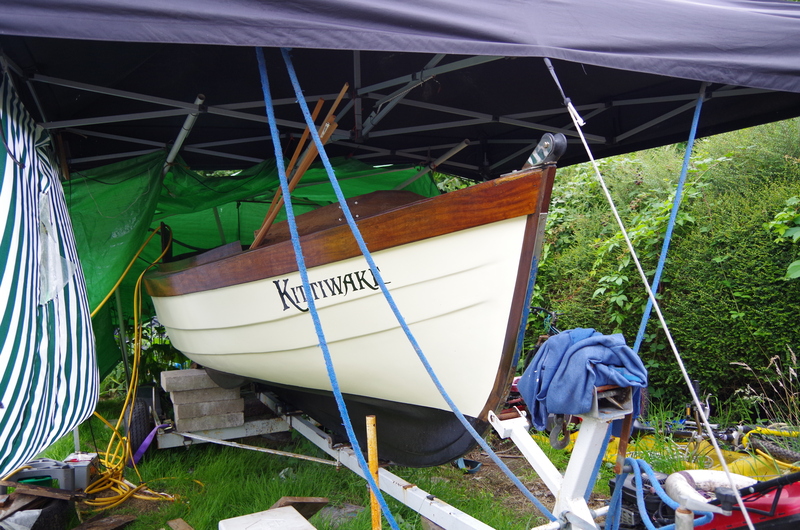 Kittiwake is about 16-17 feet and has a long keel but also has a slot for a centerboard which is filled in so it was thought of as a sailing boat : she does however have a fixed diesel engine and sterngear so she is more workboat than dayboat/dinghy. Its a total refit and Chris seems to be doing a bit of everything all at once, she’s looking very neat with new paint : various of the Chris clan are working away at the underside sanding while Chris is sorting the engine and the leccy-tricks. At some time he wants to put a rig in it..be nice as a lugger. Engine i believe is a Faryman diesel. Nice project and being done on a tight budget. Previous To Gym or not to Gym ?